The Sixty Best Episodes of XENA: WARRIOR PRINCESS (36-40) | THAT'S ENTERTAINMENT! With all that said, let us resume with episodes 36-40 on the list. This is the first appearance of Ares on Xena and it’s one of Season One’s most powerful episodes. 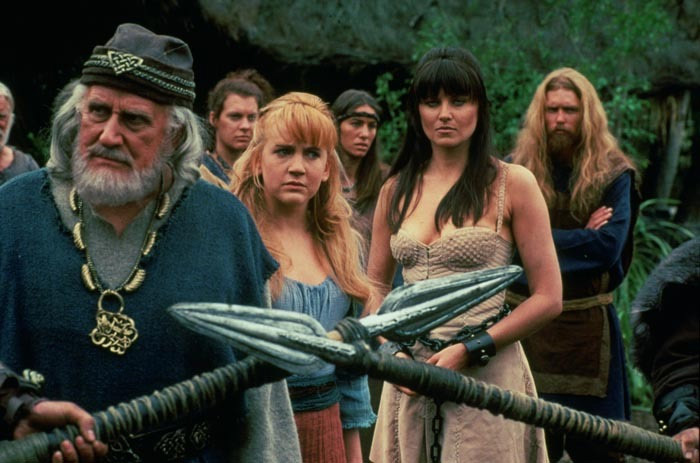 Xena comes to the defense of a group of villagers, battling a mysterious man in a black cloak. After he disappears, Xena tends to the villagers’ severe wounds. But when the other townspeople arrive, all they see is Xena standing over the bodies with blood on her hands. She is arrested and put on trial. Ares visits her in prison and reveals that he was the cloaked stranger, asking her to return to his tutelage and rule by his side. The best moment in the episode is a chilling one in which Xena rages, breaks free from her chains, beats the guards, and accidentally wallops Gabrielle in a fit of anger. I love when Xena gets pissed. And this early episode shows just how chronologically close she still is to her days as an evil warlord. The inner conflict is great, and the introduction of Ares as a force drawing her back to the past is a great pull. But we know things will work out in the end. After all, it is only the sixth episode. This is Part Two of the Season Four premiere. (Part One is actually a stronger episode than Part Two, so you’ll be seeing that one featured in a later post.) Part Two continues where the first part left off. We get to see more of Alti, the evil shamaness with a deliciously raspy voice, and her dramatically thrilling power to make her enemies experience moments from both their pasts and futures. The writers make brilliant use of that device when Alti and Xena face off in an exciting battle where Alti intends to kill Xena by making her experience her death prematurely. (Do you follow me?) But the vision Alti shows Xena has her being crucified alongside Gabrielle. Since Gabrielle is dying in Xena’s future, Xena knows that Gabrielle IS in fact still alive. What a wonderful way to bring the two-parter back around: Xena’s quest to find Gabrielle. 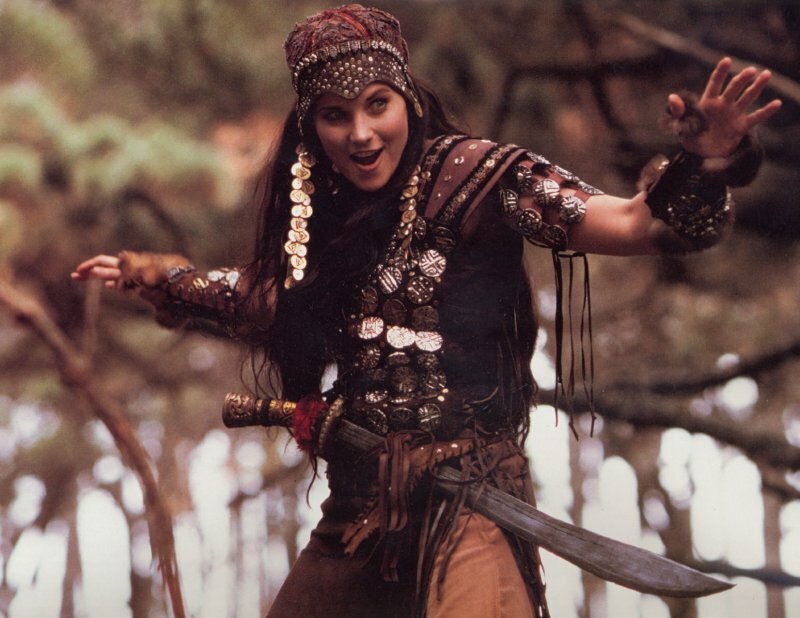 However, the best moment of the episode is the flashback where Evil Xena kills the entire Amazon tribe just for fun. She’s great when she’s bad. This episode belongs to Gabrielle, who gets most of the action after Xena is struck with a poison dart. Gabrielle must impersonate Xena to scare off a warlord that’s threatening a village. This is the first time in the series that Xena dies. (Although, as we see, her system only TEMPORARILY shuts off.) A strong episode for the growth of Gabrielle as a warrior, this installment gives Renée O’Connor some wonderfully dramatic moments on which to flex her acting muscles. With a consistently engaging story, this episode is especially worthwhile for its moments of incredible pathos. My favorite moment occurs when Gabrielle takes out her anger over Xena’s death by beating her staff against a tree. Also of note: Salmoneus, the comic relief character on Hercules, makes his second of four appearances on Xena. He’s good – in small doses. This episode would be a good place to start for action, character, and tone, but because Xena is not the focal point of the episode, I wouldn’t recommend it as a blind watch for first-time viewers. This is the conclusion of the Season Four India arc. Eli, a street magician whom we met two episodes ago, returns, seemingly embracing his newfound role as a spiritual healer. He’s a Christ-like figure who will factor prominently at the end of the fourth season and into the following season. “The Way” includes many mish-mashed elements of Hinduism and sparked a controversy after it’s initial airing for its depiction of the Hindu gods. The episode was pulled from repeat broadcasts until the producers cut out a shot of Xena head-butting Hanuman, a Hindu deity, and added a message at the beginning and end about the beauty of the Hindu religion. But if anything were to be offensive in the episode, it would be the incredibly high amount of violence. The fight between Xena and Indrajit, the King of Demons, is one of the series’s most graphic. It’s appropriate, however, that Gabrielle, who has witnessed this altercation, finally denounces violence and decides to become a pacifist. This had been developing all season and the conflict it brought to Gabrielle and her relationship with Xena, who was also questioning her way in this episode, was fantastic. Loved it. Important episode, but maybe too much for first-time viewers. Come back next Thursday for numbers 31-35! And check back tomorrow for another Film Friday post! Pingback: HONORABLE MENTIONS: Eighteen More Excellent & Undervalued Episodes of XENA: WARRIOR PRINCESS (Post 5 of 9) | THAT'S ENTERTAINMENT! Pingback: THE XENA SCROLLS: An Opinionated Episode Guide (105 & 106) | THAT'S ENTERTAINMENT! Pingback: THE XENA SCROLLS: An Opinionated Episode Guide (301 & 302) | THAT'S ENTERTAINMENT!